his order came from a client who wanted to have a statement piece that would contrast contemporary designs with the simplicity of natural gemstones. It was a birthday gift to herself. 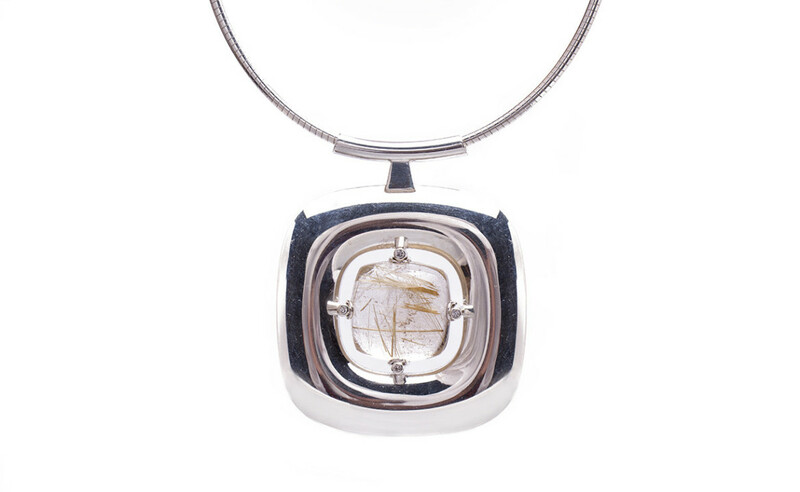 She wanted soft shapes balanced with a big pendant and highly polished Sterling silver. It was a challenging project because of the use of a hydraulic press which doesn’t allow the creation of sharp edges or corners. Also the right thickness of metal and tonnage of the pressing are crucial to avoid having the metal burst. Inspiration for the right shape came from a rutilated quartz gemstone that Alex purchased especially for this pendant and she wanted to emphasise the beauty of its silhouette. She decided to leave the stone uncovered as much as possible, by leaving an open setting from behind to allow more light to come through the mineral. This allowed the enhancement of the intrigue pattern made by the golden rutile needles trapped in clear quartz.